Windows signs are an extremely popular option for a wide variety of uses. Window signs can be used in residential settings for no soliciting signs and security decals. Alternatively, in commercial settings almost any store with a bricks-and-mortar location will have some kind of window sign communicating store hours, sales and promotions, branded signs and more. For those asking what type of window sign to buy for their store or home there are a number of considerations including transparency, whether you want it viewable from the inside or outside, and whether it is intended to be used permanently or temporarily. These considerations are what many people face when deciding between window clings (temporary and non-adhesive) and window decals (semi-permanent and adhesive). While we might touch on some of these aspects in today’s post, we’ve previously written extensively on how to choose between a window decal and window cling. Further, there is additional helpful information and FAQ on decals and clings on their respective product pages. Just scroll to the bottom of those pages and many of the common questions around these products are answered! How Do Static Clings Stick? 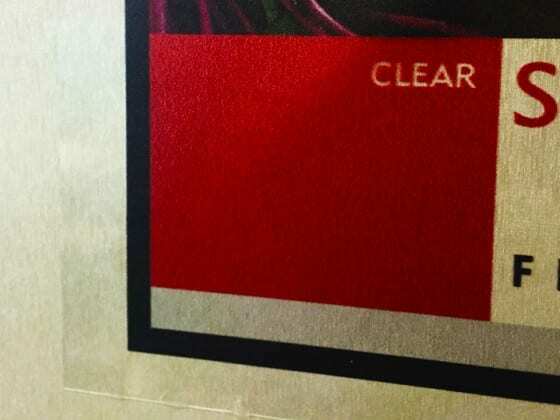 When most people hear or read the product name (clear) static cling they instantly assume that the fact that the cling has no adhesive property that it must adhere to the window using a static charge or static electricity. Using these facts it is easy to determine that static clings don’t actually use a static charge. If this were the case it would not stick to itself but actually repel away from itself much like magnets with similar charges. 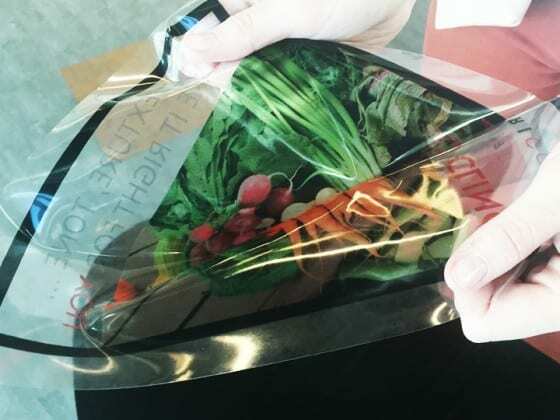 But anyone who has worked with a static cling or even something like plastic wrap knows that it can easily (and frustratingly) stick to itself (see below) if not handled carefully! Static clings will definitely stick to themselves if not careful! Another great litmus test is to use the example of metal. Metal is a known conductor of electricity. A static cling that is likewise charged should not then stick to metal but repel away from the surface. But through common use we know that static clings will adhere to non-porous metal surfaces. Thus, there is no static charge in the cling! 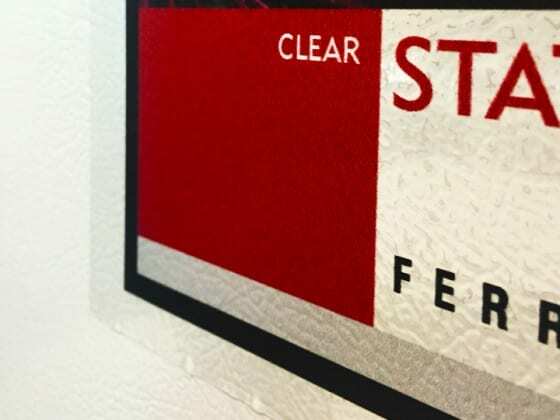 Static clings will stick to non-porous surfaces including metal. Clings will also stick to plastic. Now that we know it’s not actual static electricity nor any kind of adhesive material that causes the cling to adhere as you want it to, we’ve provided a quick explanation of why and how it actually does cling to the applied surface. The static clings actually work due to the fact that the thin vinyl they are made from act like a mini-suction cup when pressed onto a similar cohesive force or surface. These similar surfaces bond to each other with a little bit of pressure which creates an extremely versatile signage option assuming you have a non-porous surface to apply it to. No adhesive, no static electricity but a functioning window cling! Knowing how static clings work leads to a greater understanding of when and where they will and won’t function properly in everyday use. Does The Surface Where Applied Impact Functionality? Yes! Your static cling will need to be used indoors or outdoors on clean surfaces. A lack of adhesive means that inclement weather can easily cause the cling to begin to peel away from the surface or outright fall off over time, so we usually recommend an interior application. In rare instances extremely high humidity can also cause problems. But the beauty of static clings is the ability to peel it off and reapply it as needed. Because we most often recommend indoor usage, the most obvious solution for store fronts is to create clear static clings with an “inside glass” option that allows it to be seen from outside your store by approaching customers. This successfully offsets the weather aspect and the need for customers to see your window signs! The other surface considerations are smoothness and porousness. Any non-smooth or porous surface will not work for clings as the smooth surface of the cling needs something to stick to in order to work properly. Thus, glass surfaces work best but metal and some plastic surfaces will also work. Do External Elements Affect Stickiness? Yes. As described above clings can be adversely impacted by weather and even humidity in rare cases. Make sure to use them in a dry indoor location after cleaning the smooth surface where they will be applied. How Many Times Can I Remove/Reapply My Static Cling? Unfortunately there isn’t a magic number or even a way to determine a specific number of times that a static cling can be used. Like any other type of signage clings have an estimated lifespan and will eventually lose the ability to stick to your window. While removing and reapplying constantly will undoubtedly shorten the lifespan compared to a situation of apply it once and leave it, static clings are meant to be removed and reapplied. So feel free to use it in this way as often as needed. These window signs truly are a cost effective and versatile solution. Will They Lose Stickiness? If so, can I regain it? Printing – where printed the static cling is not going to stick like it normally would. This should be considered when designing your cling. Some strong cleaners can ruin the ability of the cling to continually be removed and applied. Non-smooth or porous surfaces as discussed above. Lack of use for extended periods of time. Much like elastic in shorts that go bad after years of sitting in a drawer, clings can lose their ability to stick to a smooth surface after years of not being used. Wet or extremely humid surfaces can cause the cling not to stick. Dirt or grime build up on your cling can cause it to stop sticking. Unfortunately once a cling loses it’s ability to stick, it’s difficult to regain it. If you run into this issue, try using a mild detergent and water on your cling to renew its life. Also through proper care and maintenance and use of the cling this ability to adhere to any smooth surface should last a number of years. Hopefully a better understanding of how static clings stick to windows and the other questions we’ve covered will help you select the type of window sign you might need for your home or storefront. If you’ve decided on a cling make sure to check out our window cling page or get started on our design tool where you can upload your own logo or file. We also offer free design services if you need help creating your static cling.